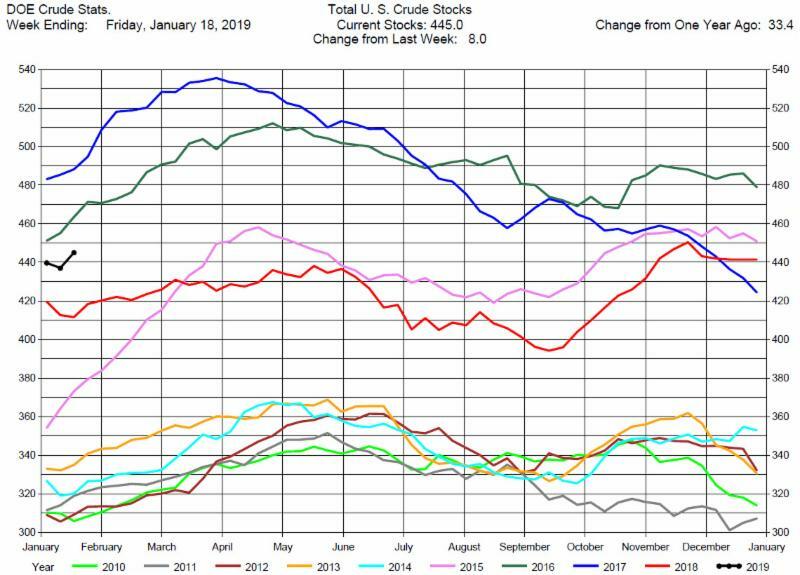 The DOE reported Total Crude Oil Inventories increased by a large 8.0 million barrels to 445.0 million barrels for the week ending January 18, 2019, while expectations average was for no change in inventory. Overall hydrocarbon supplies increased by 6.7 million barrels to 1,267 million barrels. 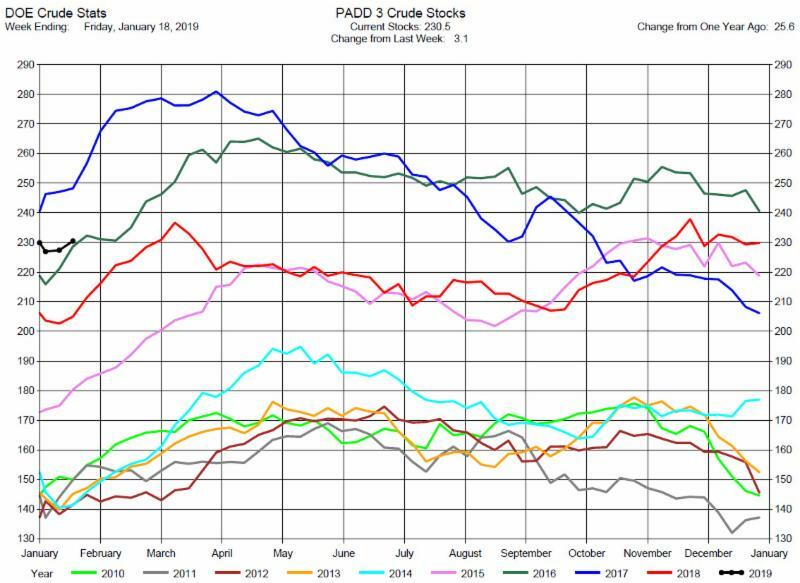 Crude Oil Production remained at a record 11.9 million barrels per day. 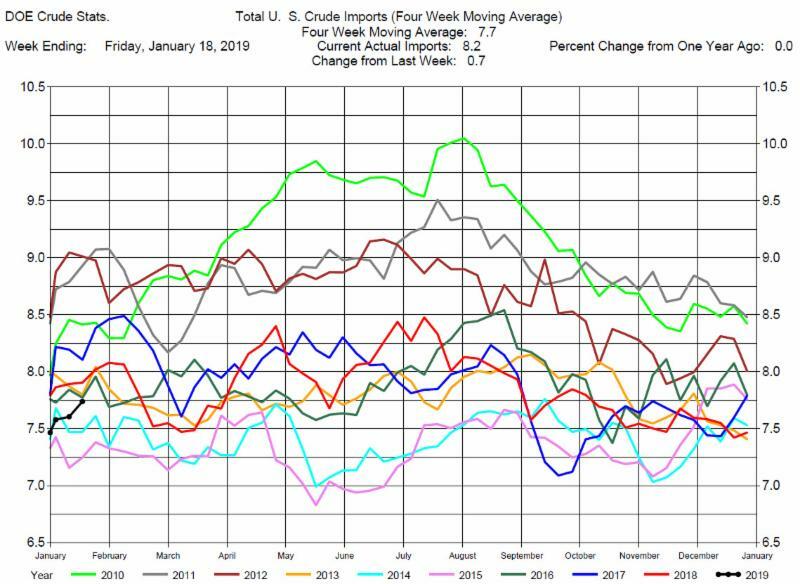 Total Crude Imports were up 700,000 barrels per day to 8.2 million barrels per day. 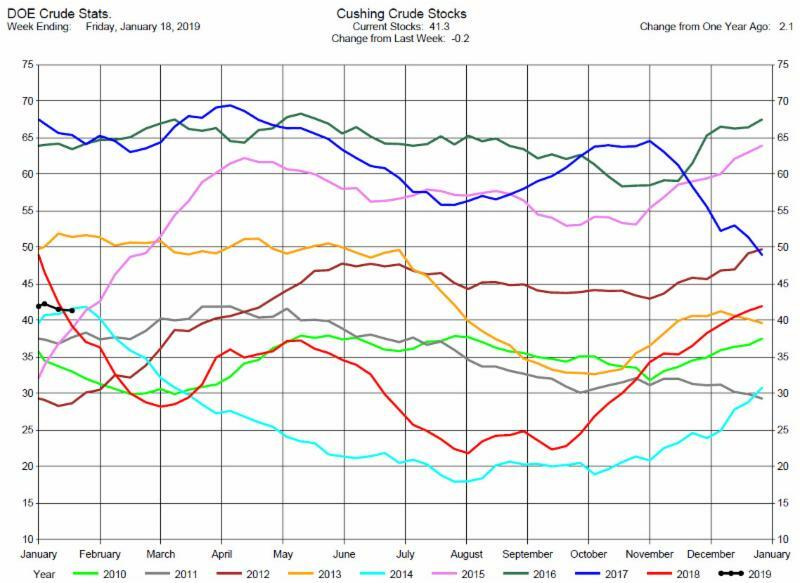 Total Refinery Crude Runs were down 200,000 barrels per day to 17.05 million barrels per day. 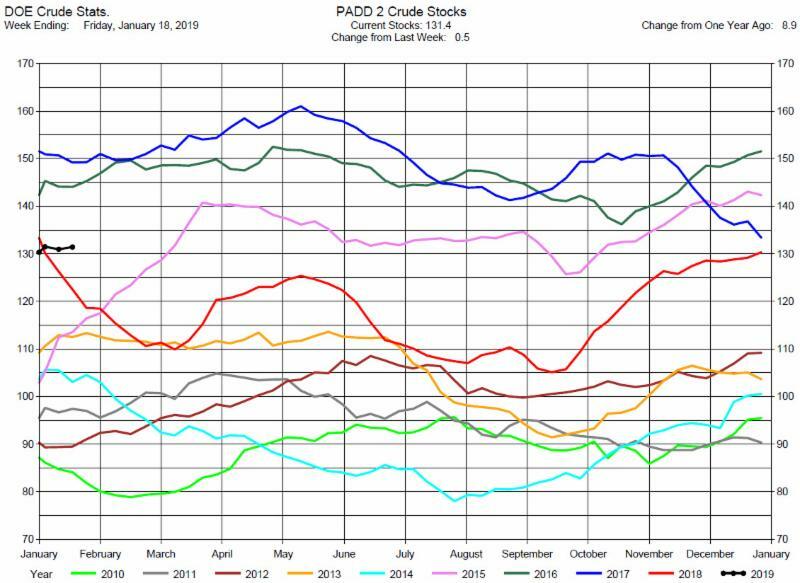 The report was bearish to crude oil prices with the crude and total petroleum stocks builds and prices initially dropped with release of the report. However, prices were supported by the turmoil in Venezuela and the possibility of US sanctions on Venezuelan crude exports. Prices traded up about 60 cents by the end of the trading day. 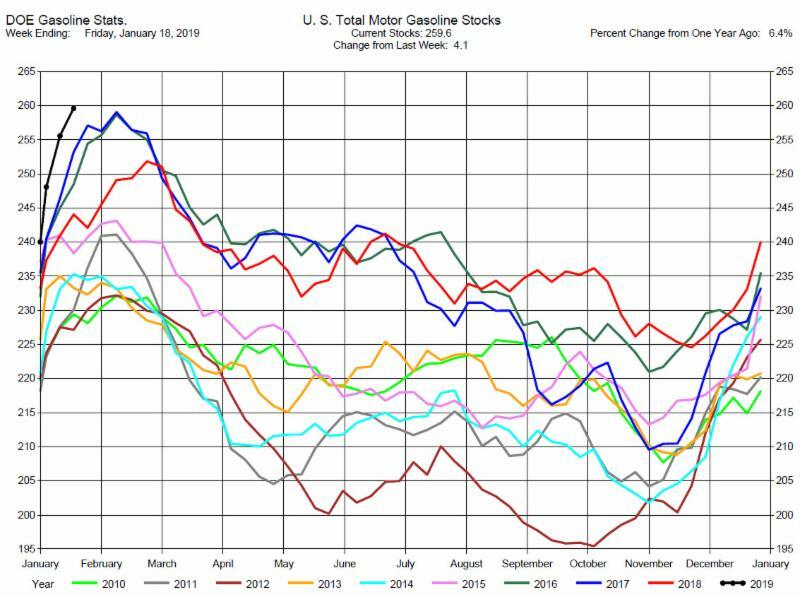 Total MotorGasoline Inventories increased by 4.1 million barrels to 259.6 million barrels for the week ending January 18, 2019. The expectations average was for a 2.7 million barrel increase. 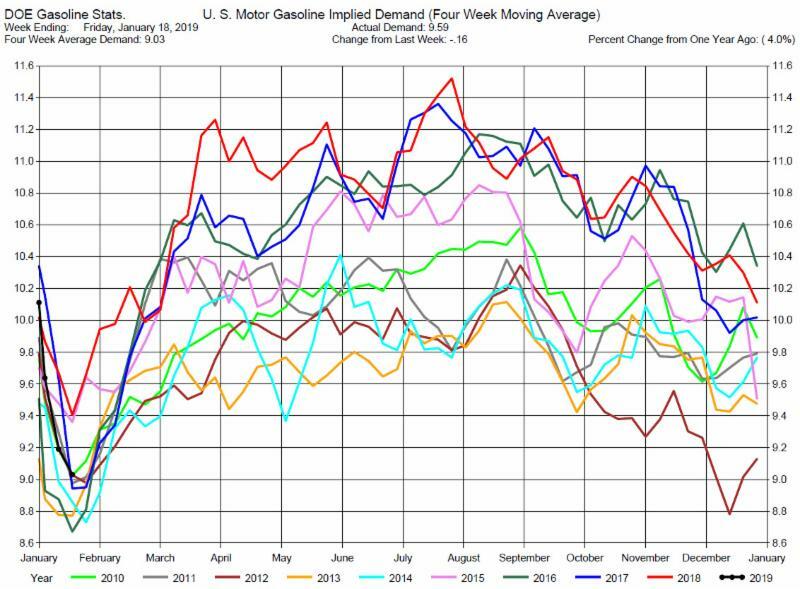 Implied Demand was down by 160,000 barrels per day to 9.59 million barrels per day. 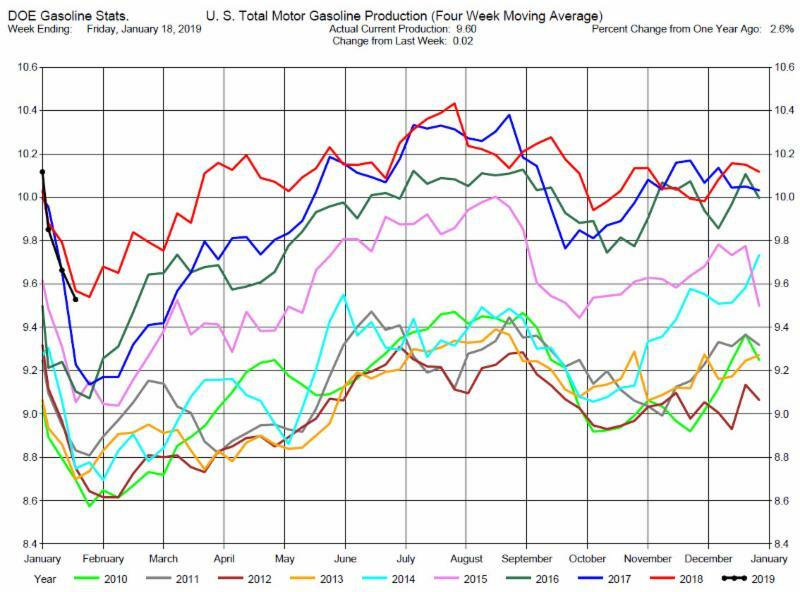 Gasoline Production was up by 20,000 barrels per day to 9.60 million barrels per day. 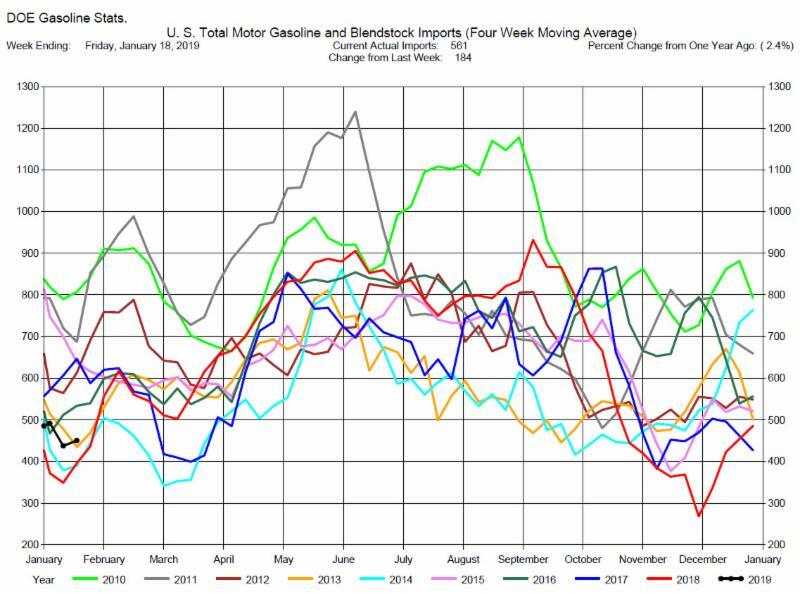 The DOE report was again very bearish to gasoline prices. Gasoline prices did drop after the report release but then tracked crude and rallied for the rest of the day, ending basically unchanged. 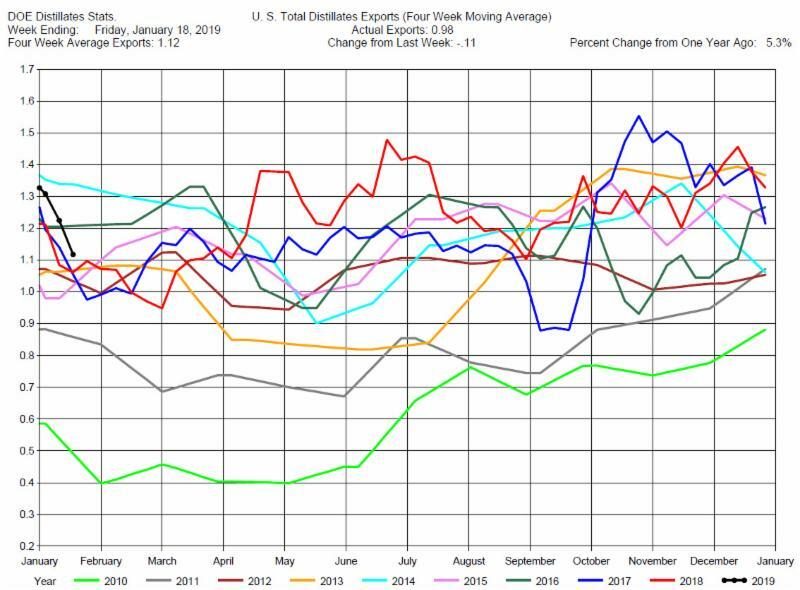 Distillates Stocks Draw, Close to Expectations. 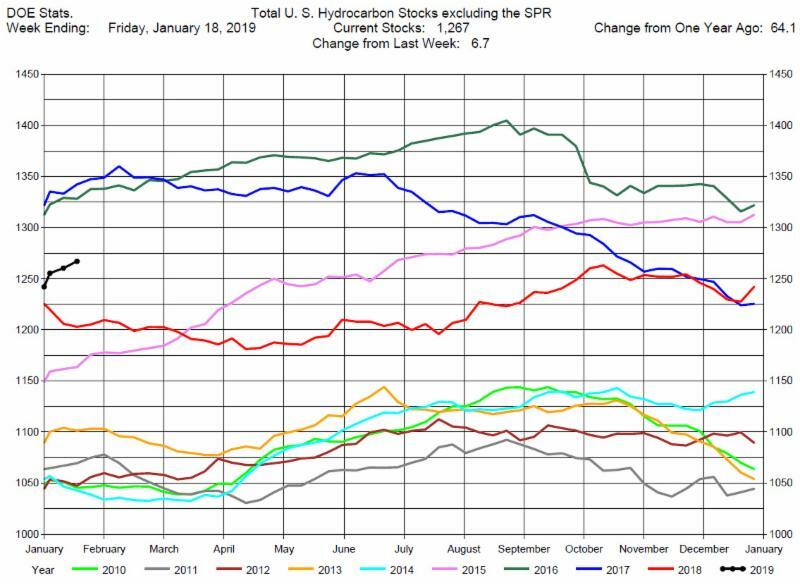 Total Distillates Stocks decreased by 600,000 barrels to 142.4 million barrels for the week ending January 18, 2019, while expectations average was for a 200,000 barrel draw. 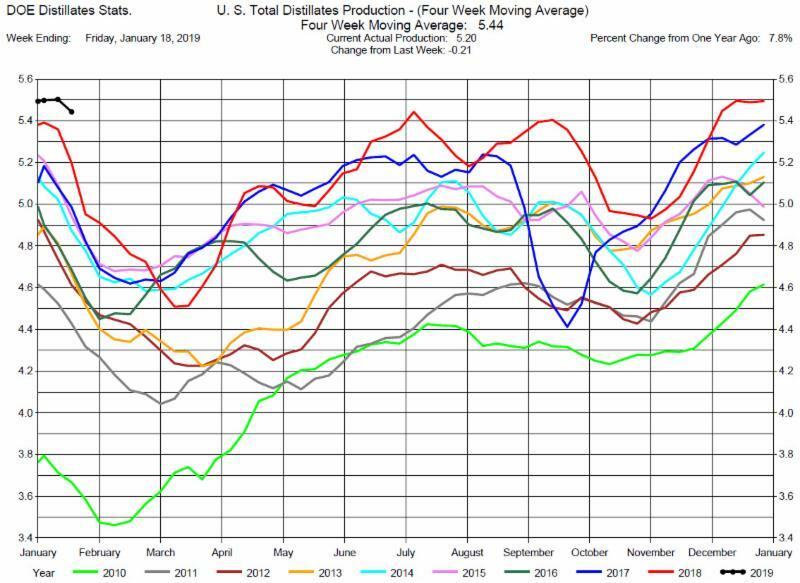 Total Distillates Production was down 210,000 barrels per day to 5.20 million barrels per day. 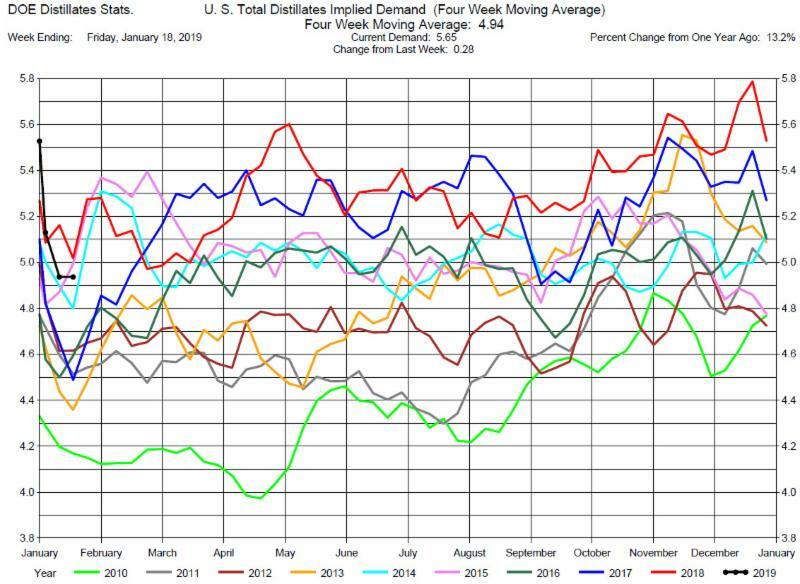 Total Distillates Implied Demand was up by 280,000 barrels per day to 5.65 million barrels per day. 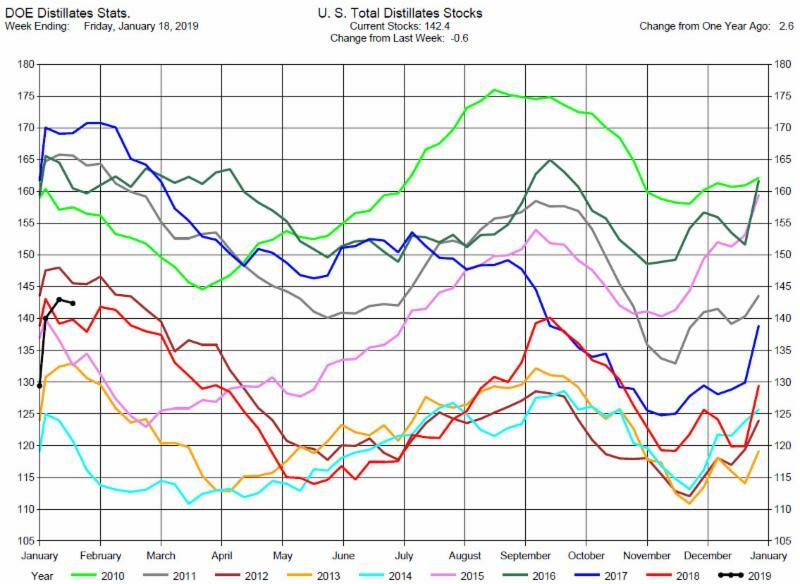 The DOE report was also bearish to distillates prices. 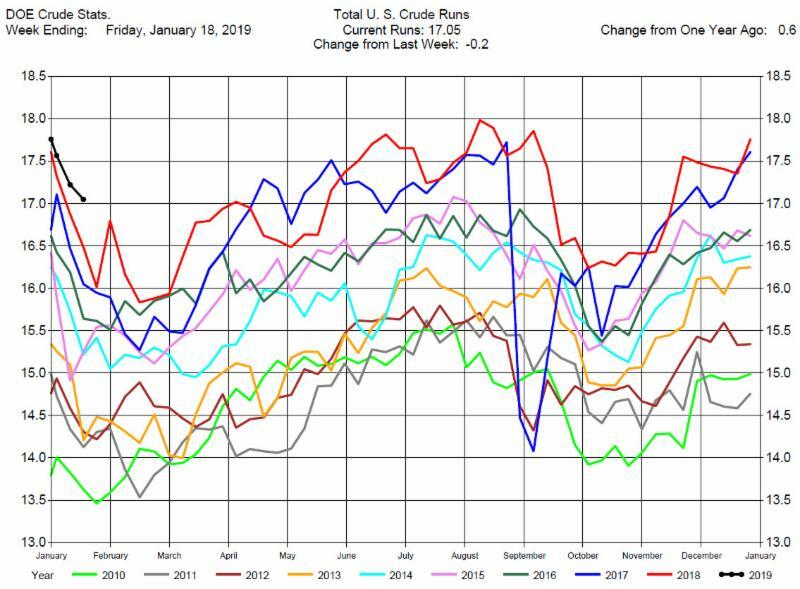 Like gasoline prices, heating oil prices did drop with the report release but then tracked crude and rallied for the rest of the day, ending up basically unchanged.